This is a unique read exposing some dark truths in the Big Pharma industry while encouraging readers to look to another Healer Jesus, as their guide for healing. 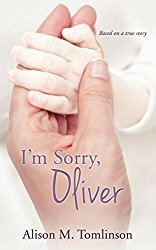 I’m Sorry, Oliver by Alison M. Tomlinson is based on the true-life events of the author. Offering insight into the spiritual realm, the author writes an amazingly unique Christian fiction filled with insight into the spiritual realm as she depicts the Scripture based on John 10:10 (NIV), The thief comes only to steal, kill and destroy; I have come that they may have life, and have it to the full. Depicting the suffering she faced through her battle to good health, the birth and death of her handicapped son and Heaven’s intervention upon her behalf, faith, miracles, angels and the demonic realm reveal to readers a story that is not only heartbreaking, infuriating, and intriguing, but gives hope as Sylvie finds new life in revived health and a deep resolute faith in God as her Healer and Savior. Through fiction, Alison presents her years of struggle with her own health and that of her severely handicapped son, Timothy. Capturing a mother’s loving heart and complete devotion to her son, the author sheds light into deception into the medical industry, unveiling that it is not the cure-all that people believe it to be. From a nutritional perspective the author learns her sensitivity to gluten, and that the human body is designed to heal itself with the right nutrients. This is a moving and compassionate story, offering readers elements of surprise, intrigue, suspense, real-life drama, the Big Pharma industry, and deception within the medical community that make for a surprising, yet unforgettable drama that is thought-provoking and challenging, yet transformational and inspiring, leading people to the truth of Jesus, the Bible and God’s healing power and wisdom. A highly recommended read for Christians and non-believers alike! ~ CBM Christian Book Reviews.